Getting around the City of San Fernando is easy! Transportation services include a local trolley service and dial-a-ride services. The City of San Fernando also offers alternative sustainable fuel options! The City of San Fernando also offers alternative sustainable fuel options! Charge your Electric Vehicle at one of our five charging stations or fill-up your Compressed Natural Gas Vehicle at our filling station. Click Here to learn more. 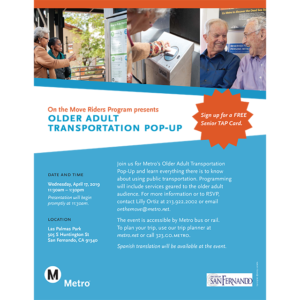 The Los Angeles County Metropolitan Transportation Authority (Metro) plans to expand its bike share system and they are looking for YOUR INPUT about where new bike share stations are needed. Bike Share allows users to pick up a bicycle at a self-serve bike station and drop it off at another bike station for the same price as a bus ride. It’s ideal for short distances or to complete a trip after taking transit. Having a bike share system can expand your community’s transportation options. Bike share also provides a convenient way for visitors in your city to travel car-free. Bicycling can lead to improved community health through increased physical activity. In short, users buy a pass, get a bike, take a ride, and then return the bike at whichever station they would like. Metro has created a map to crowdsource suggested Bike Share locations. Click Here to suggest a location. Get the latest information regarding the Los Angeles County I-5 improvements.